California Campaign for Strong School Libraries: Become a "Best Seller"
Strong school libraries don't happen overnight. They are built. Their programs are visible. They are promoted in many ways. 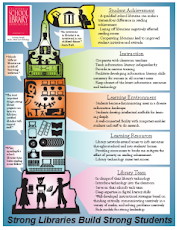 A strong library program is a cornerstone of a healthy school. Yet, in times of budget crunches the program is often sacrificed. There are many excuses. The bottom line is that school libraries need state standards, enforcement of the standards, visibility, and advocates -- those we call "Best Sellers". The good news is that the State Board of Education has approved Model School Library Standards -- blueprints for strong school libraries. School Boards and the School Boards Association. Members and CSBA should do the research, create an action agenda, and recognize school districts that embrace the Model School Library Standards. People-power. This includes social networking, word-of-mouth, conference presentations and exhibit booths. You get the idea. This costs time, but is well-worth the investment. Traditional marketing and advertising. Think billboards, advertising on buses and BART, public service announcements and videos. This costs money. Please donate expertise and dollars to the California School Library Foundation. Donate directly to the Campaign - CLICK HERE. Show your support. Visit and buy items in the Campaign Gift Shop.